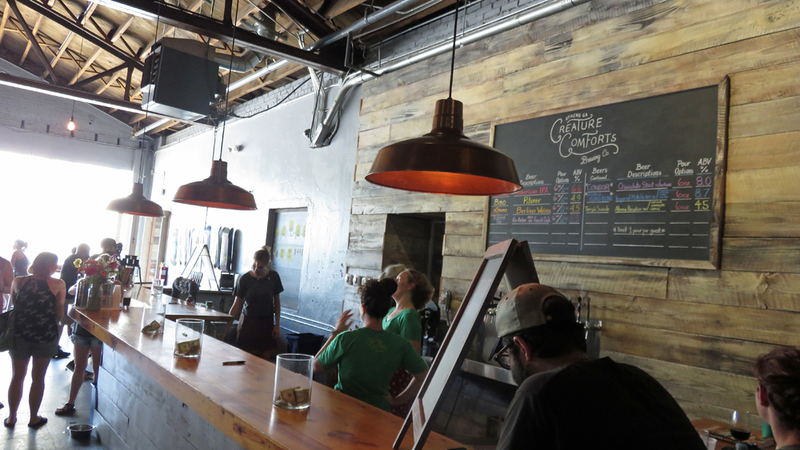 Creature Comforts in Athens, GA Could Be the State’s Best Brewery – Why Am I Not There? Georgia is not a craft beery destination. 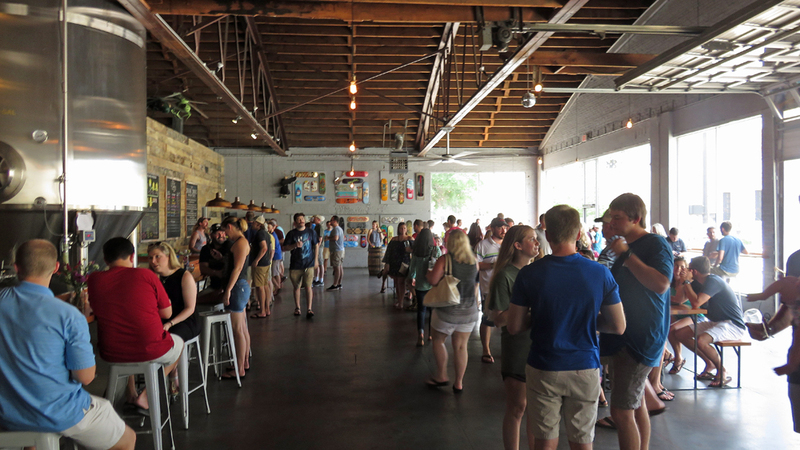 Yes, they have breweries, and two nationally-distributed names (Sweetwater and Terrapin), but for a state as large and populous as it is, it doesn’t hold up. With 53 breweries as of 2016, it ranks 49th with breweries per capita. There are may factors too elaborate to get into, but one of them, their laws, are changing September 1st. I went to five breweries in Athens and Atlanta, and I still can’t figure out the laws. Basically, breweries can’t sell you beer on the premises. They sell you a glass, which you could put beer in. As for buying canned or bottled beer to go, that I’m not even going to bother to explain. Which brings me to Creature Comforts in Athens. When I got to the space on Hancock Street near the Georgia Theater, there was a sign at the entrance, “43 Days Until We Can Sell You Beer”. Basically, what happens (this will be change on Sept. 1), I had to buy a pint glass and a wrist band for $12. On the wrist band were 6 tabs. I go to the bar, ask to sample a beer, they take a tab off my wrist ban and they fill my glass with 6 oz. of beer — good for half a glass. I repeat the process five more times. At the end, I keep the glass. This happened at three other breweries — Orpheus, Sweetwater and Terrapin. Yes, it was a bit of a hassle, but damn they serve amazing beer. They don’t distribute outside of Georgia, so everything was new to me. In my research, they are known for the Tropicália IPA, which when they started out, would sell out instantly upon arrival at stores. It stands at 96 out of 100 on Beer Advocate. I made that my first sample and damn, it was amazing. It’s more on the sweet and fruity side, and not overtly hoppy bitter. Best of all, it smelled wonderful and refreshing. Their other best seller is Automatic pale ale, named for local boys REM’s Automatic for the People and Weaver D’s restaurant. For a low ABV beer, it has the most robust flavor possible. The other I sampled included, Koko Buni porter, Reclaimed Rye red ale, Bibo pilsner and Athena sour berliner weisse. Beyond the beer itself, on the Saturday afternoon I visited, I was surrounded by friendly people who struck up conversations with me. Many were jealous of beer adventures I had planned for this road trip. I was able to get some six-packs to go, but I had to jump through some hoops. I had to pay at one register, take the receipt and bring it to another area. When September rolls around, I’m sure the Creature Comforts people will revamp their tap room procedures to make things less confusing for visitors like me. For now, I got my Automatic and Tropicália to get me happy.